ARC Billet Rod With Bearings. Fits GX160 & GX200. The stock rod is the weak link in your engine. Protect your investment with this high quality rod and bearing set. A must have for big horsepower and high rpm applications. ARC Billet .020" Longer Rod With Bearings. Fits GX160 & GX200. The stock rod is the weak link in your engine. Protect your investment with this high quality rod and bearing set. A must have for big horsepower and high rpm applications. This Conrod is .020" Longer than stock, bringing the piston flush with the top of the cylinder on most GX160 & GX200 Engines. ARC Billet Rod With Bearings. *FITS GX160 UT2 ENGINES* The stock rod is the weak link in your engine. Protect your investment with this high quality rod and bearing set. A must have for big horsepower and high rpm applications. This conrod is .100"+ Longer than the standard UT1 3.303" conrod to be used with the .080" shorter UT2 pistons. ARC Billet Conrod & Replaceable Shells. Huge increase in lubrication to crankshaft bearing, and far superior in strength. 3.625" in length. 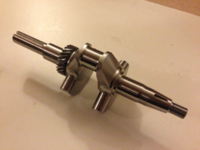 Use with our 2.3" Billet Stroker Crankshaft, also with our .490" HD Wrist Pin. ARC Billet 3.707" Conrod With Replaceable Shells for use with Wiesco Pistons. Increased lubrication to crank bearing & far stronger than any OEM Conrod. 3.707" in length, uses our .490" HD Wrist Pin. Replaceable bearing/ shells for the ARC Billet Conrod. A Pair of Special Bolts & Washers for our GX160/GX200 Billet Conrods. Cheap, quality replacement part for GX200 Engines. Genuine Honda GX160 UT2 Crankshaft.